» social Why Outrun The Bear? A night run, and in the rain too. 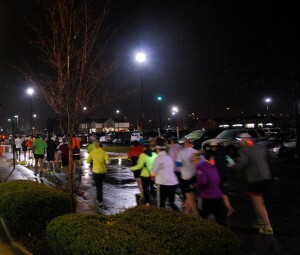 Last Tuesday night, the Columbus Running Company had a social evening run sponsored by Mizuno with every attendance getting a free gift which was a pair of running socks. The weather at 4pm on Tuesday night was horrible – it was absolutely chucking it down and I was mad – I had been looking forward to this run for ages and it looked like it was going to be miserable. The plus side was that it would be my first real opportunity to run in the rain. However as it turned out, most of the rain stopped by the time the run started. As I got out of the car I clipped my new Roosport to my shorts and walked to the store, was just about to open the door when the Roosport fell off my shorts. Not a good start. I didn’t bother messing with it any further and put it in my running jacket pocket. I switched shoes to a pair on bright green Mizuno’s, picked up my free socks and figured that at least if it does chuck it down later I can switch back to my shoes and I have a free pair of socks to change into. I didn’t win the drawing for the gloves and we soon formed up by time and started to run. I’m at the back right of this photo – initially I didn’t think it was me due to the mysterious green glow, but funnily enough that is my Garmin back-light. The previous week’s run I ran over my planned distance as I was unable to get the backlight to show whilst running so I could work out if it was time to turn around. I obviously got it working as this is the back-light shortly after I started the watch. It seemed that everyone was doing sub 9 minute miles – there were only 3 of us who were running slower than that, so everyone shot off and I ran most of the way out with one guy but he turned around shortly before the 1 mile mark. So I had company for the first 0.9 miles and at the 1 mile beep I ran to the end of the road and then headed back by myself – so much for a social run! The Mizuno (and my Glycerin 9’s) have been weird to run in lately. Due to the stress fracture in my knee, I know I’m not running evenly on both feet and I can hear the difference on the pavement – my left leg doesn’t make much noise, but the right leg slaps the pavement with every step which is most annoying. Initially I thought it was the glycerin’s but the mizuno’s did a similar thing. I’ve not run in my old NewBalance shoes recently – I used them before thanksgiving and was not aware of any issues, but I was running on gravel paths as opposed to tarmac so the noise was not as noticeable. The Mizuno’s were pretty comfortable although they were a bit stiff across the top of the toe and I could feel them rubbing a bit as my feet flexed on impact. Thanks to Mizuno for sponsoring the run and thanks to Columbus Running for putting on the event and congratulations on being one of the top 50 running stores in the country – a well deserved honour.